The FC8 Alpha, once again sets the benchmark for small, sleek, powerful and silent computing. The FC8 Alpha is more than just the next iteration of the FC8 product line, its a massive redesign which subtly refinements to its form and function. With its stylish understated looks, the Streacom FC8 is a case that would complement the audio visual experience in any home. 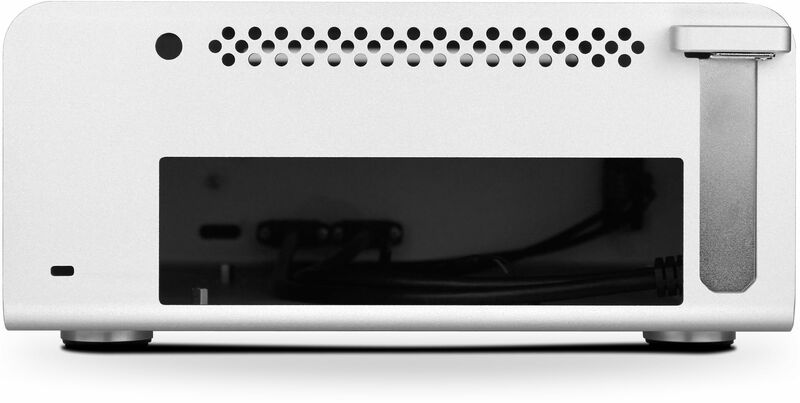 Thanks to its specially designed fanless CPU cooling system, the FC8 offers totally silent cooling. 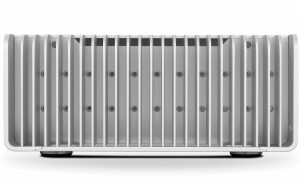 The finely sandblasted aluminium cabinet is beautifully finished and will look at home in any audio visual system or home theatre. 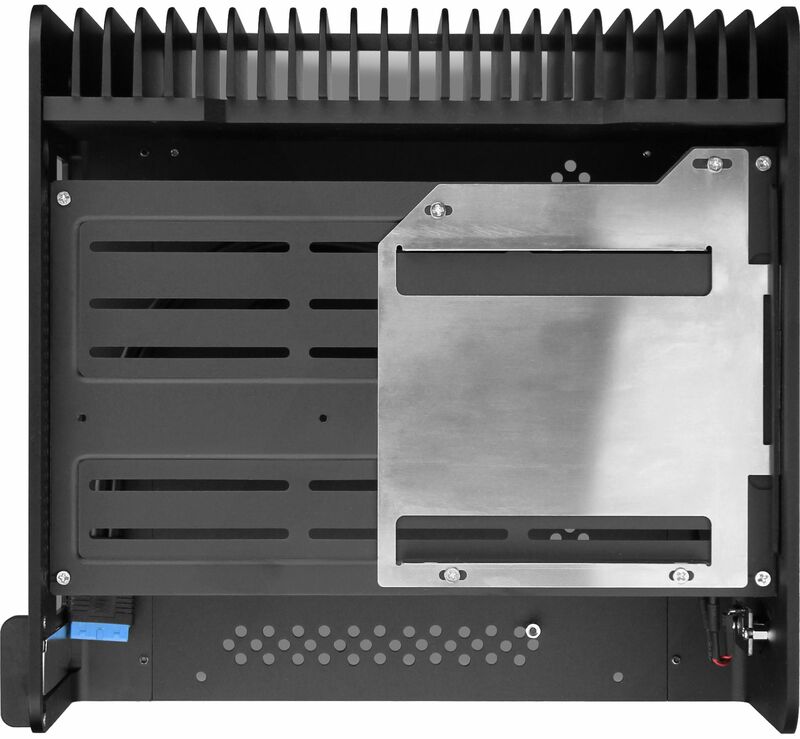 The chassis is supplied with a fanless CPU cooler that is designed to passively cool CPU's that have a Thermal Design Power (TDP) of 95W or lower. The chassis can do this with the use of heatpipes that attach to the CPU cooler and then onto either side of the chassis which features large aluminium heatsinks that naturally dissipate the heat - providing silent cooling of the CPU! The drive tray has been totally re-designed to make it more versatile than ever. The tray supports 2x 3.5", whilst still having room for an optical drive and a 2.5" drive. Alternatively, a maximum of four 2.5" drives could be used instead of two 3.5" drive. 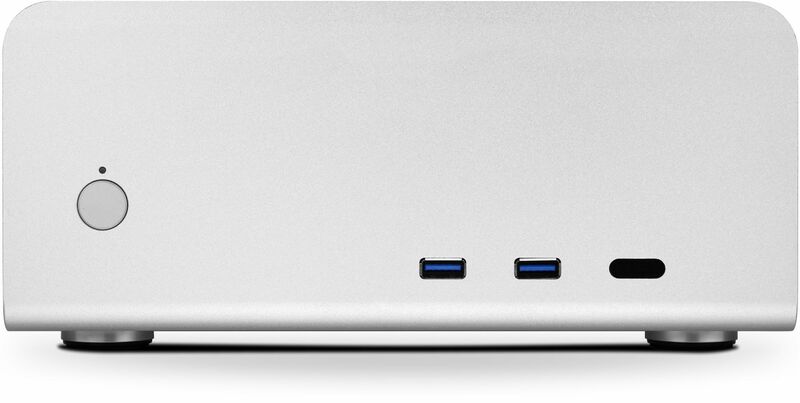 As with all Alpha cases, USB3.0 is native and the power LED is now a subtle pure white. The heatpipes and mounts have also been updated for easier installation. Streacom have a comprehensive build guide that provides general tips and suggestions on what should be considered when building in a Streacom case and how to achieve the best results. Motherboard and CPU - The FC8 is only compatible with Mini ITX motherboards. Depending which motherboard you opt for will determine which CPU to use. 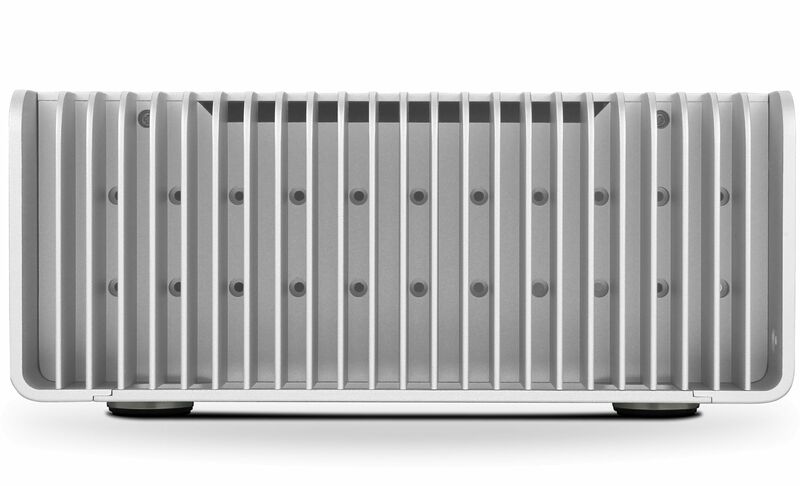 The case is capable of cooling virtually all CPUs that have a TDP of 95W or lower. 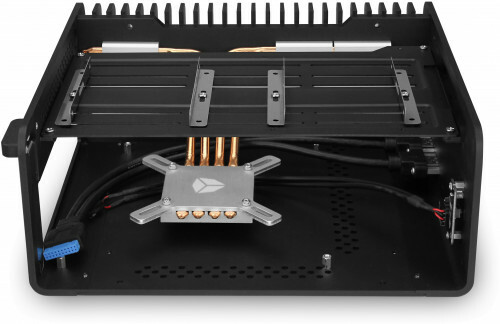 One important point to note when selecting a motherboard is that the board must not have the 24-pin ATX connector located under the heatpipes otherwise the Nano PSU adapter will obstruct the them and it will prevent the CPU block from being fitted. If there are any partial obstructions in the path of the heatpipes then it is possible to use only two heatpipes for 65w (or lower) processors. Note: Although the overall cooling ability of the case allows the use of 95W processors we would strongly advise using a processor with a TDP of 65W or lower to avoid using more power than a Nano PSU can provide. Power Supply - We recommend using a fanless the Streacom Nano PSU which can provide up to 160W of power. This is more than enough to power a CPU that has a TDP of around 65W along with suitable peripherals. It is recommended not to overload the number of peripherals; a few HDD/SSDs, one optical drive, a TV tuner and obviously a motherboard should not be a problem for this miniature PSU. Optical Drive - The FC8OD uses a new universal eject mechanism so it will work with any slot loading laptop drive regardless of where the eject button is located on the front of the drive. Streacom have already sourced the perfect drives for these cases, take a look at the available drives here. Remote Control - If you wish to take control of the PC with the use of a remote control, then look no further than the Streacom Flirc IR receiver. It is designed to fit all Streacom chassis and will work with virtually any remote control. Excellent fanless case. Great heat dissipation. This case is beautifully engineered - it was my first small form factor build, but if anything I found it easier than builds I've done with larger cases. The packaging is great, with the product really well protected, and every component clearly labelled. With this and the instruction manual that has both very clear pictures and descriptions, no need to worry about putting the wrong screw in the wrong hole! * Be ready to use plenty of thermal paste. In the grooves where the heat pipes sit above the CPU, and where they contact the side of the case, aim to make a thin but continuous line of paste. (I started building systems when you were always advised to be sparing with paste, and in my first attempt with this case I didn't use enough.) This is the one place where the pictures in the manual could be clearer. * Recently Streacom changed the stock heatpipes to have a shallower rise - so they contact the side panel next to the lower line of screw holes (not the upper line as the manual shows). * For an socket AM4 AMD processor, you need a different CPU mount (sold separately for a few pounds here). I wouldn't be surprised if Streacom start including it as standard, but for now, there you are. * A 65W CPU should be ok at moderate load and with cool ambient temperatures. If you push it harder, or the ambient temperature is higher (hello summer 2018!) you may be at the limits of stability - my Ryzen 2400G struggled under heavy load. Also, the chipset will get hot, and an M.2 drive on the underside of the board will get very hot. * An undocumented feature of this fanless case is that, if you have less than two drives, you can quite nicely rig a 12cm fan to the underside of the drive tray :) It will get inflow from the back of the case, and push air through the perforations on the bottom. If you can live without absolute silence, this is worth considering. Overall a 5* product which is obviously designed by a team that really care about it, and is a great product within the inevitable constraints of size and fanlessness. Installation was very straightforward, with only the heatpipes being a wee bit fiddly. Heat dissipation was adequate for a Core i3 8100 but that only has a TDP of 65W. Not sure how it would fare with a CPU with a higher TDP. I have no GPU or drives installed either, so there is little additional heat generated within the case.